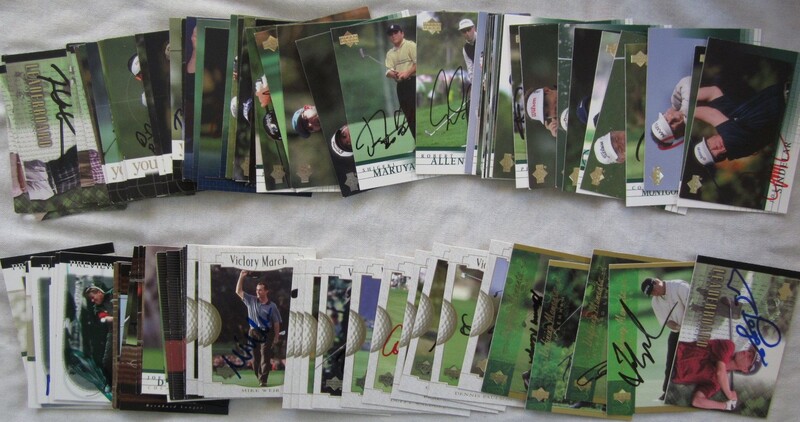 Lot of 92 different autographed 2001 Upper Deck PGA Tour golf regular issue and insert cards (various pens) including dozens of cards signed by major winners: Fred Couples #7 and Defining Moments #131, Mark O'Meara #10, Tour Time #187, Victory March #171 and SP Authentic Preview #4, Craig Stadler Victory March #172, John Daly Tour Time #194 (personalized to Allison) and SP Authentic Preview #1, Lee Janzen #14 and Leaderboard #93, Padraig Harrington #18, National Heroes #NH11 and SP Authentic Preview #46, Mike Weir #20 and Victory March #166, Tom Lehman #22, Leaderboard #96, Defining Moments #136 and Victory March #154, Nick Price #23, Mark Calcavecchia #24 and SP Authentic Preview #11, Nick Faldo #25, Stewart Cink #31 and Victory March #158, Jeff Sluman #49, Gary Player Legends #54 and Defining Moments #140, Bernhard Langer Legends #56, Leaderboard #105, Defining Moments #135 and National Heroes #NH13; Raymond Floyd Legends #61 and SP Authentic Preview #5 and 56, Ken Venturi Legends #67 (deceased). Other notables include Colin Montgomerie #9, Matt Kuchar Young Guns Rookie Card #86, Jesper Parnevik Tour Time #184 and SP Authentic Preview 55, Rory Sabbatini Young Guns #80, Robert Allenby National Heroes #NH4, Thomas Bjorn National Heroes #NH8 and Chi Chi Rodriguez SP Authentic Preview #60. All autographs obtained in person at various PGA Tour and Champions Tour events, with certificate of authenticity from AutographsForSale.com. Cards average NrMt condition. ONLY ONE LOT AVAILABLE FOR SALE.